At Hashimoto Contemporary,in San Francisco, 1010’s (pronounced ten-ten) is closing his debut US solo show, “Limbus”. The Germany based street artist is presenting new works on painted paper, as well as a large mural within the gallery. 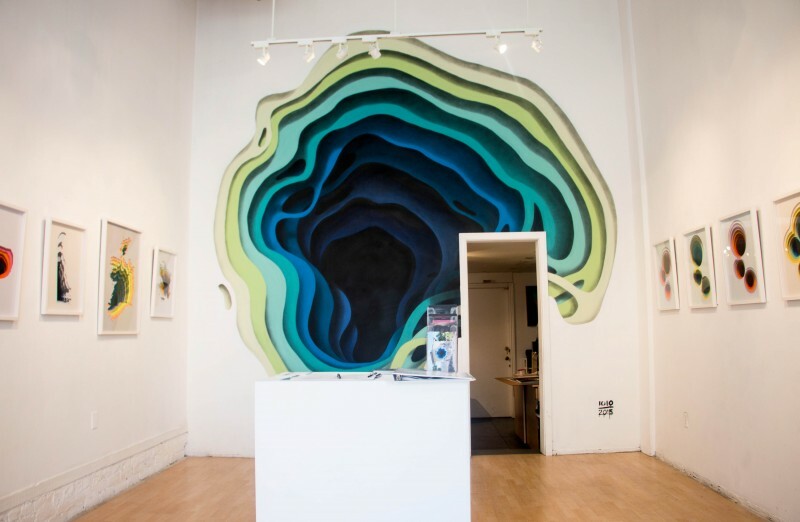 The mural takes center stage as you enter the gallery door. The conventional space transforms into a station for mental transport, as your mind is allowed to wonder through the portals into some unnamed adventure on the other side. 1010 first began creating his "hypnotic portals" in 2009 throughout the city of Hamburg. Using the sides of buildings and abandoned wall spaces 1010, turns an unassuming wall into a colorful gradated void that seems as thought you could step right in and out to the other side. The depths that the artist creates on a 2D plain is perplexing in a good way, as the murals trick our mind into believing his transported vision. Stunning layers of colors closely overlap as they spread out like liquid that pools up into the darkness at the endless center. The artist carefully maps out work that works its way out of the darkness, finally reaching the lightest colors on the wavy borderline. The “…resulting polychromatic grottos disrupt the stagnant structures of the urban landscape, bringing a beauty and mystery to the systematic components of the city they inhabit”. While 1010 usually works on a massive scale out in the urban landscape, the artist also explores small “portal on a smaller scale”. 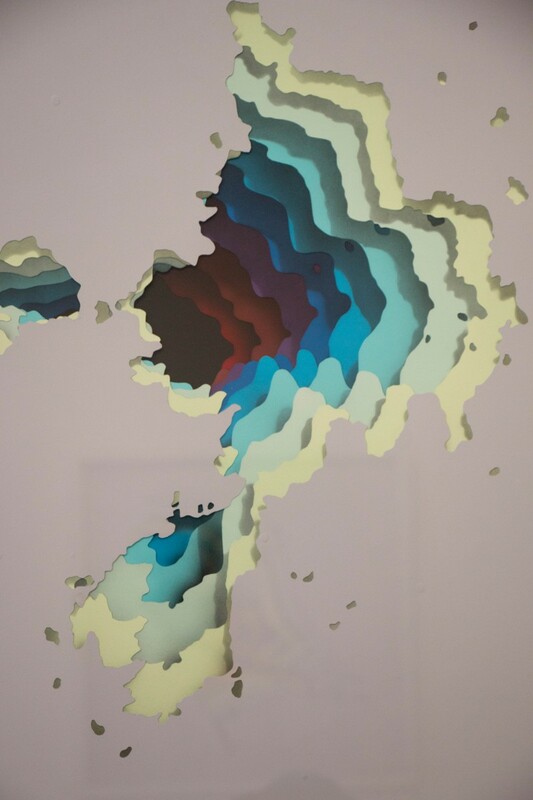 For “Limbus”, he obtains the same effect of the giant murals on painted paper, compressing the portals to an easy examinable specimen, like a slide sample. Each paper is carefully cut out with a natural flowing design and then spray painted to create shadows that draw the viewer deeper into the portals center. “Referencing the outer border of one’s cornea and the white of the eye, the term Limbus touches upon the visual language of 1010’s work and his expedition into our automated perceptions of the world we see around us”. Go check out this nearly sold out show before the end of the month. It really is a must see. Words and images by Jaklin Romine.